Meet your guide at Castle Clinton, a former fort inside Battery Park in Manhattan, to hop on the ferry to Liberty Island. You’ll bypass the lines with priority boarding, allowing you more time to enjoy historical facts about the Statue of Liberty National Monument and learn why it is a symbol of freedom for some many people worldwide. Admire the New York City skyline as you disembark on Liberty Island and explore the grounds on a guided tour. 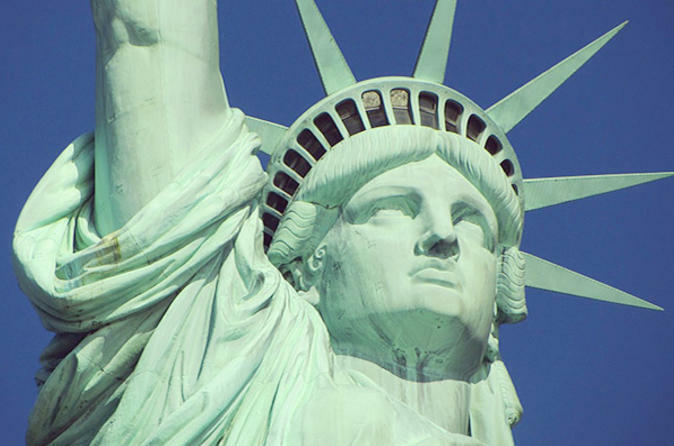 Your ticket grants you access to the pedestal of the Statue of Liberty, which features several observation levels and a museum with exhibits on the iconic landmark’s construction and architecture. Afterward, board the ferry to Ellis Island and listen as your guide shares information about this historical gateway to America. Upon arrival, tour the grounds and spend time at the Ellis Island Immigration Museum. Inside the restored Great Hall, hear stories about the former federal immigration station that processed more than 12 million immigrants from its opening in 1892 until closing in 1954. You'll also learn how US citizens can trace their ancestors here. You are on your own for the remainder of the visit, staying as long as you want before you return to Manhattan. Please note the 8:30am tour will have the least wait. Later tours will encounter longer wait times.